Taken a few years ago, during my first (and hopefully, not last) trip to Paris this picture is one of my favorites, and was the first thing I thought of to fit the “distorted” theme of this week’s photo challenge. Taken from inside the museum, it shows a beautifully “distorted” view. 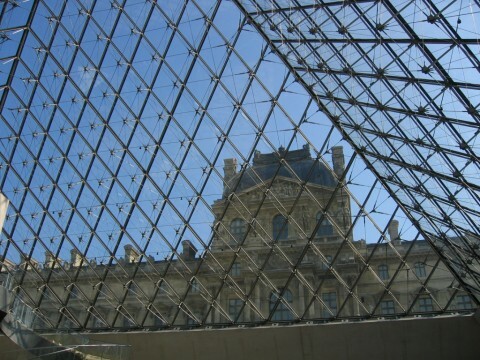 The pyramid, at the entrance of The Louvre Museum, was designed by I.M. Pei, and completed in 1989. It is a magnificent structure that takes your breath away when viewed from any angle, especially at night in its lighted splendor, spectacular! Very clever answer to the challenge! Then again, what else was I expecting from you? You rock, after all! Beautiful city, you’d love it! I realize it is a beautiful piece of architecture but I cannot reconcile such a modern piece next to such a classical building. Lucky you to be there. At least they built it next to the existing buildings (which actually complements the view) in other cities/countries they might have just demolished the old to make room for the new. Great compromise, I think. Welcome to my blog! Love your pictures until I get to travel one day I travel via other people’s experiences. Somehow eating a big mac while looking at the louvre does not fit with my romanced picture of my one day trip to Paris. Hi Vivian,thanks for stopping by and for your comments. I feel the same when it comes to “mind travels”; I read a lot of travel blogs to get my travel fix. It is also lots of fun meeting people from all around the world. Welcome! 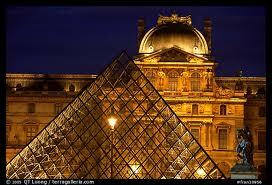 Hi Kimberly, since you are up there for some time still, you can always go into the Louvre and recapture your shot. Right? I hope you are having a grand time in Le Paris! Good picture. I remember the controversy when they built the pyramid but everyone seems to like it now! I understand that there is a McDonalds inside it now! A Mickey D’s inside the Louvre? What is this world coming to?